The ConnMan project provides a daemon for managing internet connections within embedded devices running the Linux operating system. The Connection Manager is designed to be slim and to use as few resources as possible, so it can be easily integrated. It is a fully modular system that can be extended, through plug-ins, to support all kinds of wired or wireless technologies. Also, configuration methods, like DHCP and domain name resolving, are implemented using plug-ins. The plug-in approach allows for easy adaption and modification for various use cases. * connman The core Connection Manager daemon (connmand) and plug-ins for Ethernet, WiFi, Bluetooth, DHCP, DNS proxy, VPNs (Openconnect and OpenVPN) and PolicyKit. * meego-panel-networks The MeeGo GTK+-based ConnMan user interface. You can get it here . ConnMan uses modern infrastructure, like D-Bus, udev and netlink, to provide a native integration into the operating system. While netlink is used on the system level to communicate with networking devices, the whole separation, between system daemon and user interface, is done through D-Bus. indicator-network and connman are now included in Maverick Meerkat, so there is no need to install any PPAs. 4. 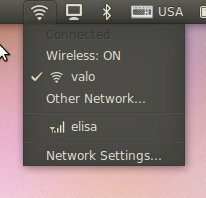 Use NetworkMenu by clicking network indicator icon. Note :- note that network-manager is still installed, but not running. Also the nm-applet is removed from the panel. 5. Use NetworkMenu by clicking network indicator icon. With natty network-manager is automatically removed and there's no need to remove it manually. ConnMan can be used in two different ways, either with Network Menu found from the panel or via a command-line tool called cmcc , both are in indicator-network package. For 3G modems a separate package ofono is needed. Also it's a good idea to install use-modeswitch also. eng= there is not existance of this type of dossier. i want my default network manager back…. I installed it and did it like it, too few options, doesn’t look like a mature applet. Went back to Network Manager without a problem.